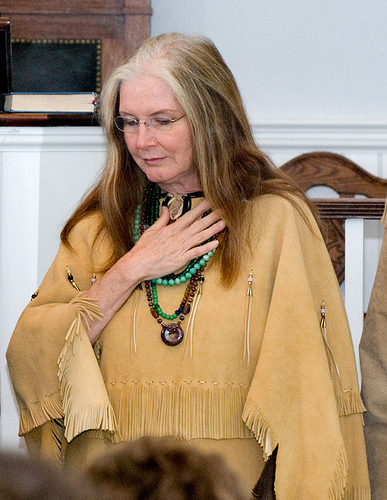 Stephanie “Morning Fire” Mugford Fielding the first Mohegan Baha'i declared in 1964 when she was eighteen years old. She declared as a Baha'i in Honolulu, Hawaii. Her father's family are Native Hawaii and she was born and raised on the island of O'ahu. She has served on many Baha’i Local Spiritual Assemblies, the Baha’i Western Regional Committee (predecessor of the Regional Councils now in existence). Stephanie has a wide-ranging background of experience and interests, and has lived all over the United States and abroad. Her experiences have put her artistic talents to work as a teacher, writer, editor, graphic artist and radio announcer. She has also served on the board of directors of educational institutions, media outlets, non-profit organizations, and religious organizations. In 2002, she received a Bachelor’s degree with honors from the University of Connecticut with an emphasis in linguistics and anthropology. She continued her education at MIT (Massachusetts Institute of Technology), gaining a Master of Science in Linguistics in 2005. Presently she lives on the Mohegan Reservation in Uncasville, Connecticut (the town is named for her ancestor Uncas - see below). She serves as an Assistant to a Baha’i Auxiliary Board Member for Protection. She has three children and five grandchildren who live in Colorado. Uncas settled his people in a village at Shantok, which the Tribe defended from a Narragansett invasion sparked by European as well as Indian conflicts. Finally, the Mohegan Tribes affiliation with the English kept its people relatively safe during King Philips war and beyond.